Did you know that plastic is found in 90% of seabirds and more than 50% of sea turtles? Did you know that there is more microplastic in the ocean than there are stars in the Milky Way? These numbers may seem crazy… that’s because they are crazy. But sadly, that does not make them untrue. "In 2012, photographer Zak Noyle captured the Indonesian surfer Dede Surinaya surfing in waters choked with trash off the coast of Java, Indonesia." View more via Huffington Post's article "The Oceans Are Drowning In Plastic — And No One’s Paying Attention"
If you think back to your last year, your last week, or even just your last day, how much trash did you throw away? How much of your trash was plastic? Once you start looking at what you use on a regular basis, you might be shocked at how much trash (especially plastic trash) you mindlessly use and casually throw away. Maybe we think ‘out of sight, out of mind.’ Maybe we think putting it in the trash means keeping it out of our environment. Unfortunately, over eight million tons of plastic trash end up in the world's ocean every year! Because the ocean covers over 70% of our planet, it truly connect us all. The plastic terror inflicted on the ocean is not just a marine problem, it is a global problem and it affects each and every one of us. Recently, I rewatched the documentary “A Plastic Ocean” and it was absolutely disgusting and heartbreaking. Images of birds puking up shards of multi-colored plastic and iridescent oil still haunt me. The visuals are tragic and undeniable. Our common daily practices and lifestyle decisions affect the ocean and all its creatures. We are inadvertent killers, and our weapons come in every shade of tossed out plastic. In the documentary, scientists cut open dead fish and birds and their cause of death was splayed out on the operating tables in various toxic-dyed shards of man-made products that we used (often only once) and tossed out of our lives, only to be seen bobbing in the blue and mistaken for food. The plastic bags we use to carry groceries home in and then so often throw away mirror the luminous bodies of jellyfish, and turtles hungrily swallow them up. 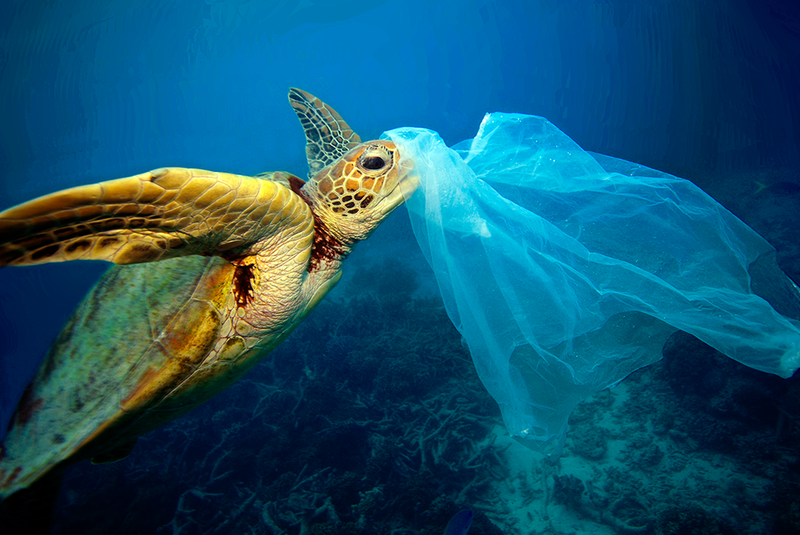 100,000 marine animals are killed by plastic bags annually and it takes an estimated grand total of 1,000 years for a plastic bag to biodegrade in a landfill. In one gut-wrenching scene, a scientist explains that her and her team found turtles floating uncharacteristically in the ocean and went to investigate. It turns out that those turtles, and countless others, suffer from buoyancy disorders from the harmful decomposition of marine debris they have ingested. Without being able to dive down below the surface for food or shelter, these turtles are destined for death. It can feel disheartening and almost impossible to hear the overwhelming and tragic reality we live in today. It is true that humans have the proven capability to destroy, but it is also true that humans have the incredible ability to nurture, to heal, and to protect. Every decision you make matters. Everything you do is either helping or hurting the environment. It takes all of us to change the world, but it takes just one person to cause a ripple effect. Align your lifestyle with your values and you will inevitably inspire others to do the same. There are so many ways you can make small changes in your life that will make big (and positive) changes for the world. And those small changes can be SO FUN! When we say BYOB (PLUS) we are talking about all the fun, reusable items you can use INSTEAD of single-use plastics. Why buy plastic water bottles that takes 450 years or more to break down into microplastic when you could just refill your super cute reusable water bottle? Why sip your coffee or tea from a boring one-time-use coffee cup when you could bring your personal-touch (in the form of a reusable mug) to your morning routine? Why eat from plastic utensils when grabbing a to-go meal when you could bring your own? Why use a plastic bag when grocery shopping (that looks alarmingly like delicious jellyfish) when there are so many fun reusable bag options? Why put restaurant leftovers in their plastic box when you could easily bring your own container? The key is to ALP (always leave prepared). Keep your reusable to-go items in your bag or in your car. 2. Say NO to plastic straws! Who really needs to sip drinks from a plastic straw? Honestly, haven’t we developed the skills to drink sans-spills without a straw by now (if you can read this, we hope you have). According to “Straw Wars” by National Geographic, Americans use 500 million straws… every. single. day! Their small size proves detrimental; entangling marine animals and being eaten by fish. So, we ask you, do you really need a straw? Coral reefs are believed to have the highest biodiversity of any ecosystem. About one million species live in the ocean. What we choose to put on our bodies affects all of those reefs, all of those species, and all of us! Be kind to the ocean, it's critters, and the entire planet by avoiding any sunscreen that kills or bleaches coral, awakens coral viruses, and pollutes the water and the creatures in it. Avoid anything containing toxins such as: oxybenzone, butylparaben, octinoxate, or 4-methylbenzylidene camphor. Cans often come in a pack of six, woven together by rings of plastic that perfectly fit around the necks of marine animals, constricting and killing countless creatures. By cutting these, you undoubtedly save millions of lives. It takes less than 60 seconds. Image from Inhabitat's article "Peanut: The Story Behind a Poor Turtle Deformed by a Six-Pack Ring"
We get it, it can be almost impossible to avoid single-use plastic containers. Even our favorite farmers markets sell locally made delicacies sold in plastic containers. But do you know what makes a container or product “single-use plastic?” Using it a one single time. For the times that you simply can’t fathom avoiding “single-use-plastic” containers, simply wash and reuse them. Give them a new life, a new purpose, and a bit longer before the landfill. It just takes a bit of forethought and a slight lifestyle change to make eco-friendly changes. There are so many fun ways to be eco-friendly, so be playful with it. Find those cute reusable bags and fun to-go bottles, mugs, containers, and utensils. Enjoy the beautiful, artistic organic cloth food wraps and stop using boring (and trashy) plastic wrap (which, by the way, contain chemicals and resins that cannot be removed and therefore cannot be recycled--ew!). As Henry David Thoreau wrote, “What is the use of a house if you haven’t got a tolerable planet to put it on?” Let’s all do our part to protect our planet that we are lucky enough to call home!